Cornell University scientists’ new research advances the design of solid-state batteries, a technology that is inherently safer and more energy-dense than today’s lithium-ion batteries, which rely on flammable liquid electrolytes for fast transfer of chemical energy stored in molecular bonds to electricity. 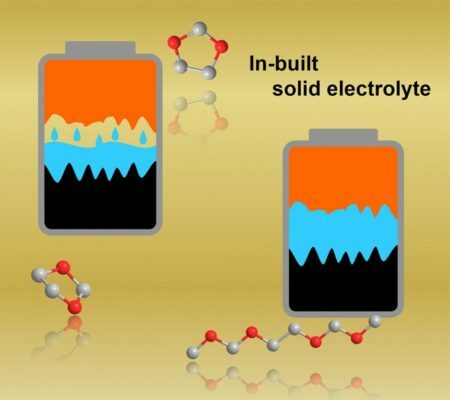 By starting with liquid electrolytes and then transforming them into solid polymers inside the electrochemical cell, the researchers take advantage of both liquid and solid properties to overcome key limitations in current battery designs. Users ask batteries to deliver energy when it’s needed and for as long as it is wanted, recharge quickly and don’t burst into flames. The new method for designing solid-state batteries starts with liquid electrolytes inside the electrochemical cell. Special molecules then initiate polymerization, improving contact between the electrolyte and electrodes. Image Credit: Qing Zhao, Cornell University. Click image for the largest view. The new Cornell research advances the design of solid-state batteries, a technology that is inherently safer and more energy-dense than today’s lithium-ion batteries, which rely on flammable liquid electrolytes for fast transfer of chemical energy stored in molecular bonds to electricity. By starting with liquid electrolytes and then transforming them into solid polymers inside the electrochemical cell, the researchers take advantage of both liquid and solid properties to overcome key limitations in current battery designs. Qing Zhao, a postdoctoral researcher and lead author on the study explained, “Imagine a glass full of ice cubes: Some of the ice will contact the glass, but there are gaps.” The study paper “Solid-State Polymer Electrolytes With In-Built Fast Interfacial Transport for Secondary Lithium Batteries,” has been published in Nature Energy. Beyond their relevance for improving battery safety, solid-state electrolytes are also beneficial for enabling next-generation batteries that utilize metals, including lithium and aluminum, as anodes for achieving far more energy storage than is possible in today’s state-of-the-art battery technology. In this context, the solid-state electrolyte prevents the metal from forming dendrites, a phenomenon that can short circuit a battery and lead to overheating and failure. A solid-state system also circumvents the need for battery cooling by providing stability to thermal changes. Despite the perceived advantages of solid-state batteries, industry attempts to produce them at a large scale have encountered setbacks. Manufacturing costs are high, and the poor interfacial properties of previous designs present significant technical hurdles. “Our approach works for today’s lithium ion technology by making it safer, but offers opportunity for future battery technology,” Archer said. Other authors are doctoral students Xiaotun Liu and Sanjuna Stalin, and Kasim Khan ’20. The research was supported by the Department of Energy’s Basic Energy Sciences program and through facilities funding from the National Science Foundation. We’ll see over the next few years if this is the technology that supercharges the conversion of and more development of a wider range of electrical devices and much higher market acceptance and growth. This article gave me a lot of insights.